The year 2017 was a game changer for the blockchain technology both in terms of valuations as well as their usability and reach. Despite such huge expansion, the reach is still limited compared to traditional systems. An average person can just pronounce the word – Cryptocurrency and expect them to understand the nitty-gritty of technology behind it as of now is no less than a mirage. So with above two issues in mind, we expect to deliver the project which not only shall teach the basics of this amazing blockchain world to every user in a very subtle manner but at the same time, they shall be able to monetize their newly found use case with a fun, interactive and informative game. No day goes by without the big media reporting on the blockchain. We want everyone to be able to participate in globalization, regardless of whether they are sitting in the street cafe with their smartphones in New York, Moscow, Tokyo or New Delhi. Horses have been traded for millennia. We've created a revenue-based model that anyone can be a part of. This model is accessible to any investor and can provide rapid user-friendly handling for larger audiences. 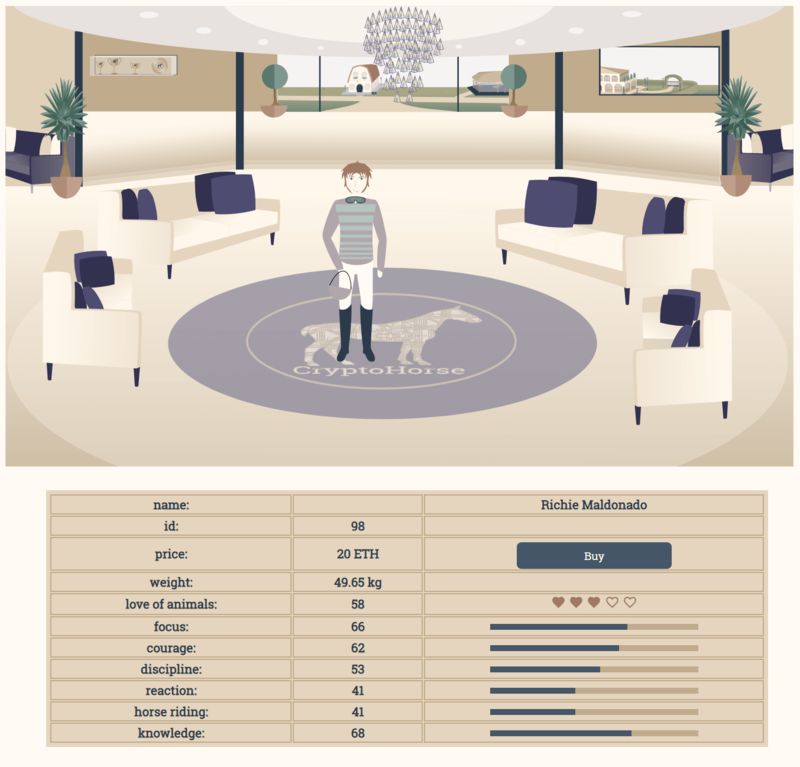 The right mating, the mate choice, the right strategy for horse racing later - a game like a real horse breeding in every stable around the world – which needs a lot of character and not yet another coin without value. We are constantly developing innovations within the blockchain space through hands-on experiments and the application of digital scarcity, digital collectibles, and non-fungible tokens. Continuous improvement of the platform for better user experience through regular updates is the highest priority. The gaming market is growing at a very rapid pace. NewZoo’s Global Games Market Report shows that 2.2 billion gamers across the globe are expected to generate $108.9 billion in game revenues in 2017. This represents an increase of $7.8 billion, or 7.8%, from the year before. While gaming market is growing by leaps and bounds but the collectible game segment is largely untapped. This is where CryptoHorse has an edge. A scarcity of the CryptoHorses shall increase their value and sustainable revenue creation shall take place by breeding them and creating new horses – it shall create a lot of value and wealth for the users. We intend to and committed to making CryptoHorse for Block Chain what Farmville is for Facebook and Candy Crush for smartphones, albeit with a difference of making the players richer by the same time. We are currently in the start-up phase and plan to integrate horse racing into the dApp within the next 3 months. The rapid growth of crypto collectibles market in recent past is evident from the capital raised by them even during seed phase. CryptoHorses are digital collectible horses which are created on Ethereum Blockchain. Each horse is unique not only in its appearance or color but their genetic composition is different which shall be stored in the blockchain. They have 9 different colors and 35 different attributes. 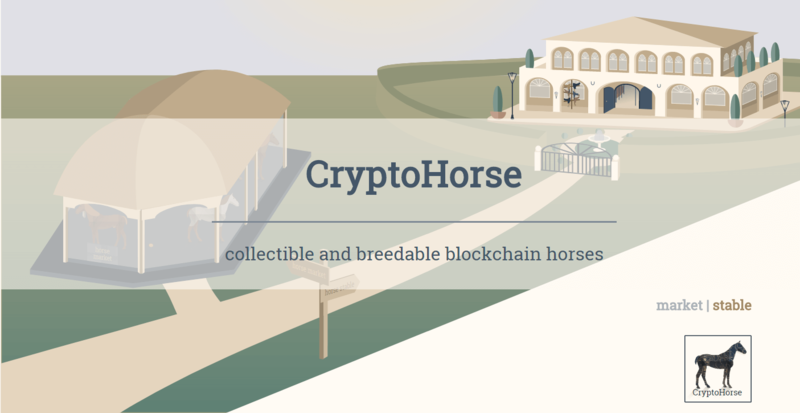 These CryptoHorses are not just collectible rather they can be bought and sold for Ethereum or bred to create new horses that have a varying degree of traits of its parents. Depending on the traits they acquire from its parents, they can be sold or traded on Ethereum blockchain. 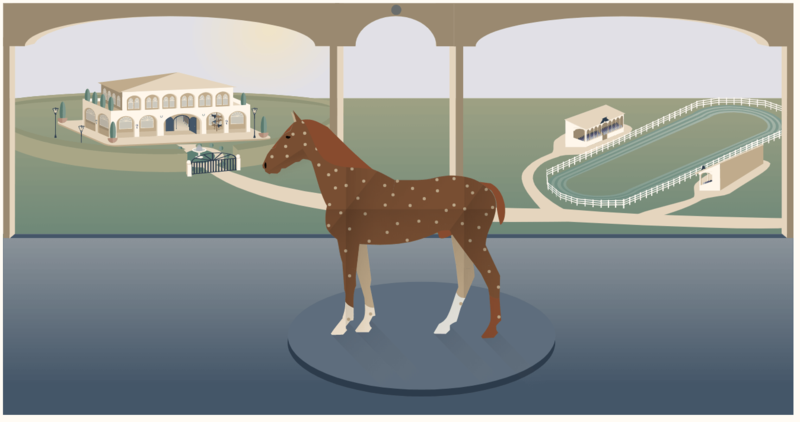 Each CryptoHorse has a particular gender – it can either be a mare or a stallion. Initially, there shall be 20,000 Gen-0 horses that will be created and stored on Ethereum blockchain. There is no provision for creating new horses after the initial 20,000 Gen-0 horses are sold. Each of the 20,000 horse is unique and has a price depending on its color and attribute. Some attributes are rare and some are common. Rarer the attributes, higher is the price. Higher the star rating, rarer they horses available on the blockchain and higher are the prices. Each horse is also pre-assigned a speed and other attributes which shall be important while competing in the horse races. Everyone can offer horses and put them up for sale. Each horse has its own characteristics. Besides, there are some fancy horses as well. Some of these have wings, unicorns or zebra type. These fancy horses are very rare and have very high collector value. However, they do not have any special speed. There is no fee that is being charged for buying your own horse beside the designated price. However, a very small Gas fee (0.04 – 0.08 US $) is payable to the miners on the Ethereum network for approving your transaction. Each horse has a particular gender – it can either be a male ‘Stallion’ or a female ‘Mare’ but not both. For mating two horses, one Stallion and one Mare are required by each user. If a horse breeder lacks a particular gender then it cannot breed and shall require another horse of opposite gender before breeding. Upon breeding, a new CryptoHorse with traits acquired from its parents shall be available in your Ethereum wallet. Depending upon the Gas price paid, the approval of a transaction from Ethereum shall take place. Mares are born often and Stallions are rare. If an owner mates the horse very frequently than the chances of breeding a mare are more. So it is not just a collectible anymore – rather a self-sustainable community of horses shall be created which can be traded on the blockchain. With an aim to create value for early investors and adopters of the CryptoHorse ecosystem, the number of times a horse can breed is limited to 4. After each mating, there is a cooling period for which the horse shall not be available for mating. The cooling period increases after each mating – after first mating 15 min, after second mating 120 min, and after third mating 480 min. After fourth mating, the horse cannot mate further. However, it shall still be available for participating in horse races. Breeding high-quality horses shall result in higher quality offspring. A user can also breed a fancy horse if the parents have the requisite genetic material. The breeding fee is approximately between 0.002 ETH to 0.04 ETH and can be changed several times during a day. This measure is to control inflation or deflation of the market. A user can see the current fee in the stable. 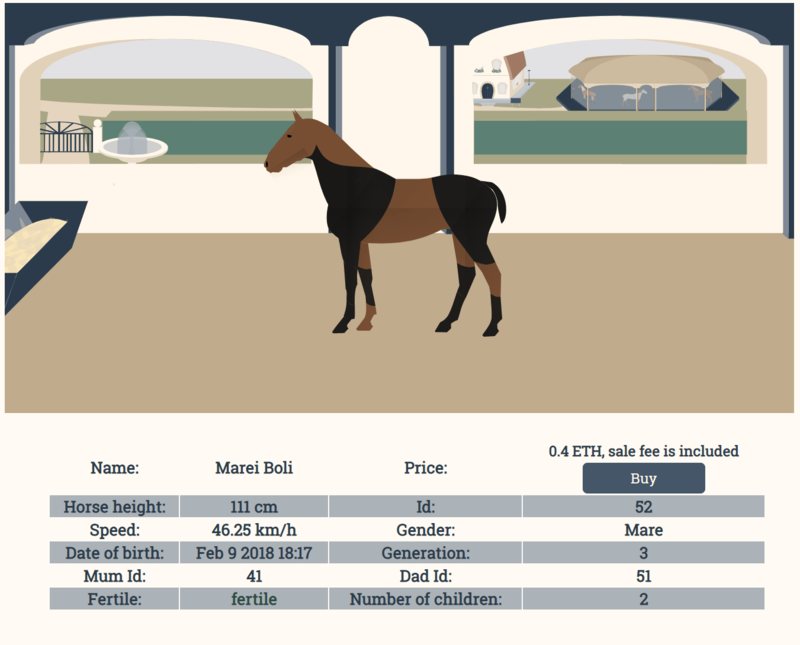 A user after buying a horse can put it up for sale as well by going to Stable. The price is decided by the seller and a willing buyer is able to complete the transaction by paying the specified price to the seller. 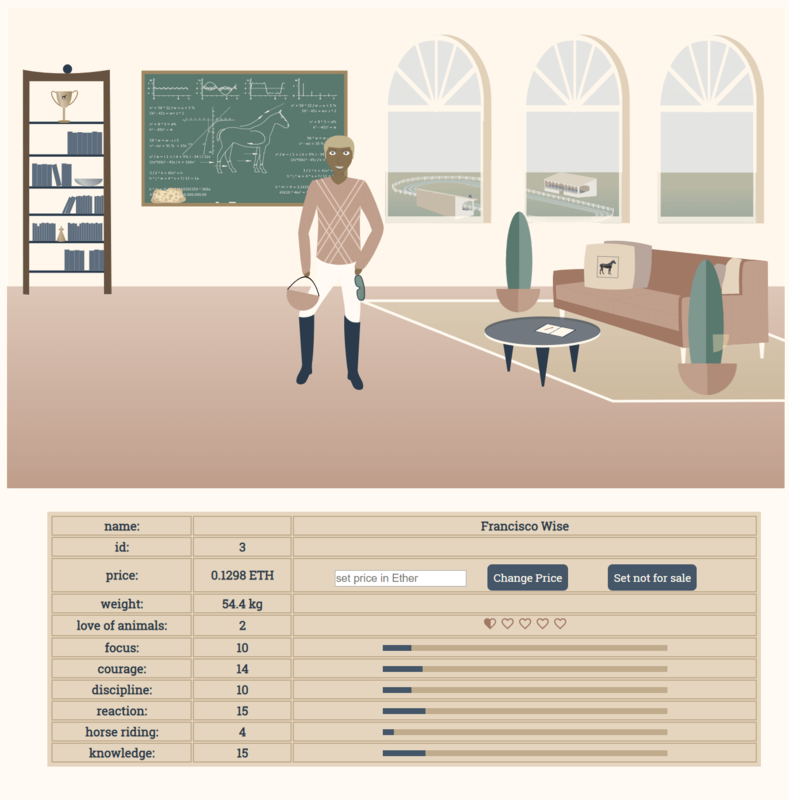 A small part (5%) from the sale proceeds of the seller goes to the CryptoHorse team. Similarly, you can take another horse of opposite gender on rent for mating or offer you horse to others at a specified price. Everyone can offer horses and put them up for sale. Each horse has its own characteristics. The price of a horse can be determined as follows. We built a clubhouse for the jockeys. Here you can buy / sell your jockeys. There are a limited number (20,000) of jockeys. Jockeys can not be bred. Every horse needs a good shoe. Also your CryptoHorse. The better the horseshoe the stronger the horse will be able to show its full speed. The horseshoe shops were auctioned in a Dutch auction. The current owners can resell their stores or change the price at any time. All horseshoes of the respective quality level are sold automatically in the respective shop. The sales commission goes directly to the owner. A good saddle means passion and perfection to the highest degree. A craftsmanship that finds its completion in our saddles. NEW! - Be part of CryptoHorseRacing and own your own store in a village that will soon become a city. There are 5 shops. Each store has a different quality that it can offer. The shops have an initial price of 20 ETH and will be auctioned in a Dutch auction. The price is always cheaper until someone buys. Once a horse passes its four mating cycles, it won’t be rendered useless. You can still race your horse in a horse race at the race course. The third attribute of speed of your horse shall come handy for it. So don’t wait too much...Ride your horses to the moon. 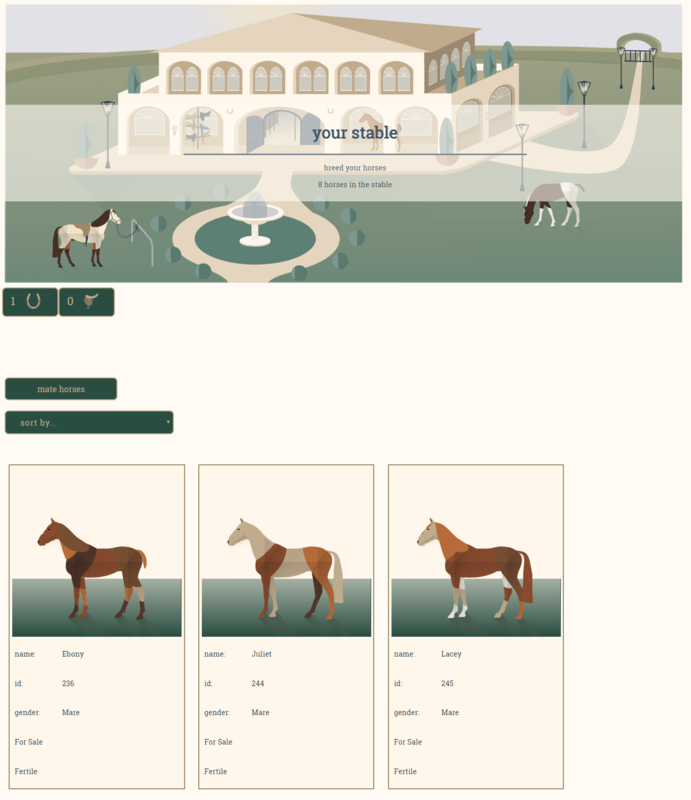 The speed of a horse can be checked by the user in the stable or marketplace with other statistics as well. Stick measurement (height) and designated speed of a horse is important to have better chances of winning the race by a horse. There are some hidden attributes as well but in general, a horse with high speed and good height have a fair chance of winning. After each race, the horse requires a cooling period. The horses which have already bred for four times shall be available for horse racing only. More the horse participates in racing, more experienced it becomes. However, the older the horse, slower it will be in racing. Buying bonus items from the horse city shall increase its speed. A racecourse is currently being developed and tested. When enough horses are sold for horse races, the racecourse shall be opened for testing the speed of your horse and the jockey inside you. 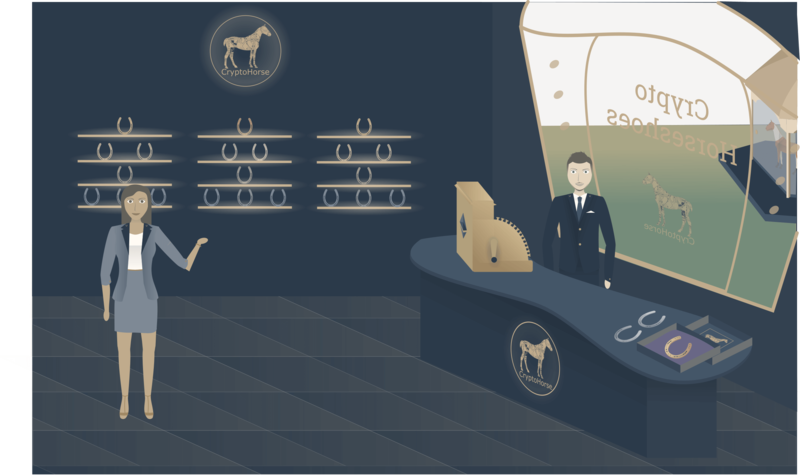 The racecourse will have its own smart contract, which accesses the main CryptoHorse contract. We are deeply proud of our unprecedented extensions in CryptoHorse - City. Rush quickly to the race boxes and do not forget the horseshoe. The first jockeys are at your service in the Jockey Club and can be purchased there. These days we coden the noble saddles for your horse. Thanks to the Long-Distance Race, 1 vs 1, or the Big Derbies up to the World Cup, there is the right race for every horse. Full of fascination we follow the current development of our blockchain based weather. A user can then buy land in the city and rent a shop. The shop, for example, shall offer horse food, water, hay, and much more. The landowners can also organize beauty contests or you can organize in your own store in the Horse City. 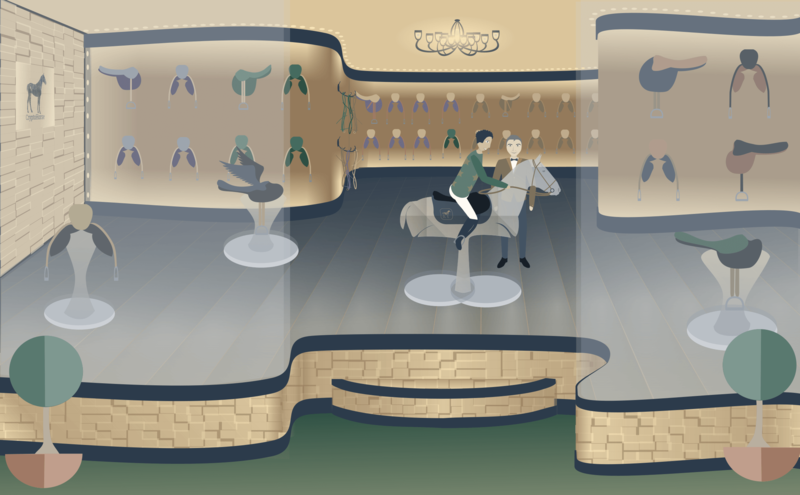 The items that a user can sell in a rented shop provide a bonus for the horse in the race and other competitions. It is also possible to buy land and rent it yourself. It will create a small city with shops later on which is planned for in the coming future. Other dApp or collectible providers will then have the opportunity to purchase a property from us to sell their own collectibles as well on the platform. - You need to register on the website. - Set up your MetaMask Wallet. - Transfer some Ethereum and that’s it. Congrats! You are a proud owner of a CryptoHorse now. Breed, Rent, Race, and Trade.